Tampa is a beautiful waterfront location perfect for a wide range of group activities throughout the year. From private vacations to family reunions, Tampa Charter Bus Company has access to a variety of motorcoaches to meet the needs of groups traveling throughout Tampa. We’ve provided efficient and comfortable group transportation services for events of all sizes in the region. Whether you need a compact minibus for a youth group event or a full-sized coach or fleet for a massive family reunion, we’ve got you covered from beginning to end. Our rental experts will be happy to assist you anytime at 813-381-5064 ! Regional events attract hundreds of thousands of visitors annually to the Tampa area. Events like the famous Gasparilla Pirate Festival not only bring visitors from around Florida, but from around the country as well. Gasparilla season is filled with multiple parades and parties ranging from an arts festival to a children’s version of the famed pirate parade. With a private motorcoach, your group won’t need to worry about transportation after partying all day in the Tampa heat. Each bus includes climate-controlled interiors to help your group cool off after a day of pirate festivities. If your group is planning to stick around town for a Gasparilla after-party at one of the city’s pubs, rest assured everyone will safely arrive to hotels or to their home. The buses we charter are operated by professional drivers, so you’ll have a built-in designated driver for the entire night! Looking to plan a tropical family reunion in Florida? Other popular cities like Miami and West Palm Beach can be crowded and difficult to navigate for large families planning their event. Tampa is a wonderful location to enjoy your family and the lovely beaches. The area boasts plenty of resorts and hotels that offer event spaces for family reunions. Your family can even plan an exciting reunion day at Busch Gardens Tampa Bay or Adventure Island. 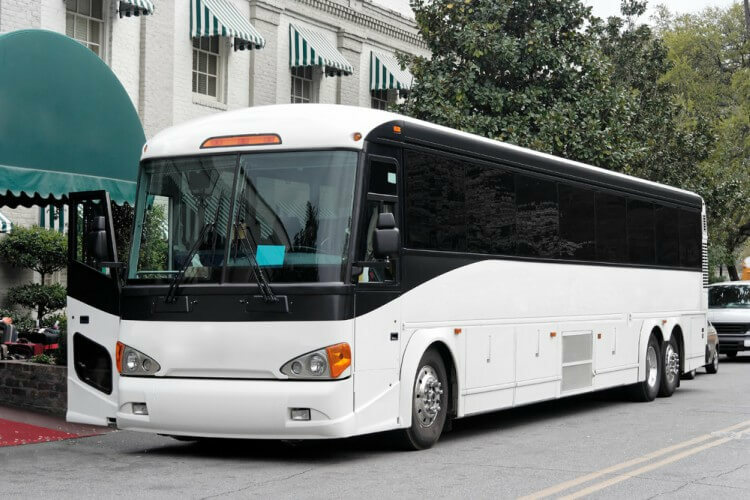 A private charter bus rental can comfortably fit up to 56 passengers, which will simplify the entire transportation process during your family reunion. We can even build a custom fleet of vehicles for exceptionally large families needing more spacious accommodations. Any family members flying into Tampa can be shuttled from the Tampa International Airport in your private charter bus rental. Family members unfamiliar with the area won’t need to stress about driving in an unfamiliar city while trying to find hotels, restaurants, and attractions. Everyone will be kept together while traveling across Tampa for this special family event. When schools are on break, students are often still learning and getting involved with the community through local camps at locations like the University of South Florida and The Florida Aquarium. Private charter bus rentals are a comfortable and reliable travel option for summer camps and youth groups needing group transportation services through Tampa. With a private rental from Tampa Charter Bus Company, everyone will be able to travel together while enjoying a movie with on-board televisions or playing games with complimentary WiFi. Skip organizing a multi-vehicle carpool and opt for a minibus or full-sized coach instead. Chaperones won’t need to stress about driving or using personal vehicles for events if you leave the driving up to the certified drivers in our network. Each driver must pass extensive background checks and have a pristine driving record before shuttling groups for any event. Wherever you travel, both parents and chaperones can rest assured that every young passenger is in good hands. Getting around Tampa with a group is simple and easy with Tampa Charter Bus Company. We pair each group of passengers with the best bus for their travel needs, along with a professional driver who is familiar with the Tampa area. We’ll be sure your transportation services are tailored to the specific needs of your private trip. Give us a call 24/7 at 813-381-5064 to chat with one of our rental experts about your Tampa trip!